← “The Birdman” at Pike Place Market. Everyone at Shutter Tours is a certified photo junkie, and I would bet that all of our employees are either thinking about photography or working on images as I write this. 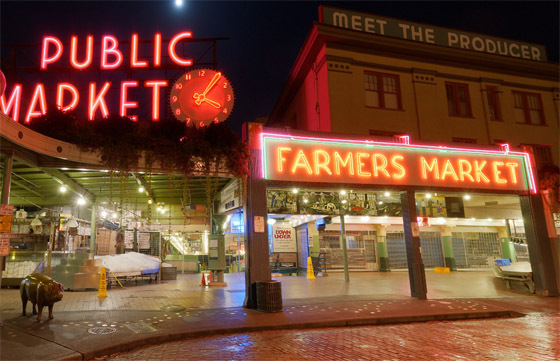 Part of the purpose of the blog is to share the beautiful city of Seattle, especially the market area. As I was searching for some historical information on the market, I was reacquainted with Bradford Bohonus’ website, VR Seattle. One photo that caught my eye was a shot of an empty Pike Place Market at night. His image is perfect in every detail, and I almost feel as if I am standing at the market as I view this, with Rachael, the pig as the lone sentry to the entrance. It’s hard to imagine 10 million people coming through the market every year when it is so desolate and quiet in this photo. The scene is very similar to the one I remember seeing as I was standing across the street on First and Pike, right where the white truck is, hearing the chants of “The Whole World is Watching” during the WTO riots. I’ll have to dig those images out of my archives and share them. It was indeed a surreal moment as a photographer here in the city. Mercedes Carrabba runs the Seattle Ghost Tour, and you can imagine what it would be like to take her tour at night and hear ghost stories while you are standing at this location. My friend Rosanne and I took her 9 PM tour and enjoyed a wonderful experience. She’s fun and a great storyteller. We have no problems suggesting other tours by the way. Each is unique, and we feel ours stands on its own merits as do the others. Mercedes also owns Ghost Alley Espresso and it’s one of my favorite coffee shops in Seattle. Order “Smog” and add some Lavender for a truly unique cup of coffee. Check out Mark Wiens video above that we started at the 6:15 mark at Ghost Alley Espresso. Start from the beginning and you’ll see his full market experience as he eats his way through Pike Place Market. If you would like to do a food tour, there is no better company than Savor Seattle Food Tours. This entry was posted in Seattle Info, Tours and tagged 360 degree, ghost tour, panoramic, pike place market, Seattle. Bookmark the permalink.